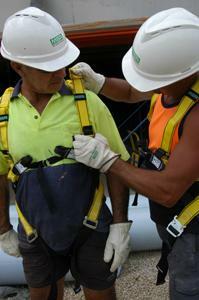 The Workman Harness Range has taken the traditional parachute (vest style) harness style to a new level. Taking the very best features of the proven Gravity Crossover Harness that is the unique floating shoulder leg strap and sub pelvic strap. Combine these with a truly unique upper body design featuring fall arrest rated frontal attach loops linked to a floating rear comfort strap and a fall arrest rated adjustable rear D-ring. Add webbing loops on the shoulder straps for confined space use giving the wearer a truly unique versatile and comfortable harness. Option of Qwik Fit or Klik Connect hardware and red/black or fluoro orange/black webbing.